Grinder Finance – Are you a Rick or are you a Morty? *burrrp* I’m going to preface this article with a belch, and the fact that I’ve just finished binge watching Rick and Morty. If you have not watched Rick and Morty, I’m sorry to hear that. You’re doing a great disservice to yourself and your Rick. I assume if you’ve not watched the show, you’re probably still a Morty. It’s okay though, I’m here to help you blossom into a beautiful (if you can call it that) Rick. I’ll assume if you’re still reading that you haven’t stopped to binge watch Rick and Morty. It’s a shame but I suppose I will need to briefly describe the dichotomy of their relationship. Rick and Morty are a lot like Batman and Robin, except Batman is a time-traveling genius and Robin is a naive, gullible child. Okay maybe that wasn’t the best description and it doesn’t quiet fit what I’m trying to explain here but bear with me. Rick is a quick decisive thinker that analyzes all outcomes of a scenario before proceeding. Morty is a whimsical character that often goes through life flying by the seat of his pants. Whenever Morty decides that something that Rick is doing is immoral, unfun, or stupid, he challenges Rick based on some very loose ideas. Rick is not the kind of guy who cares enough to prevent Morty from failing so many of these adventures end adversely for Morty. In Magic finance you want to be a Rick. You want to be able to call your picks early while having sound information to back up your claims. If you are a Morty and wait for other smarter people to figure out you end up the greater fool. If you read James Chillcott’s article this week, you may have noticed my pickups were pretty solid given the weekend’s events. I was definitely a Rick last week and upped my Rick game this weekend. 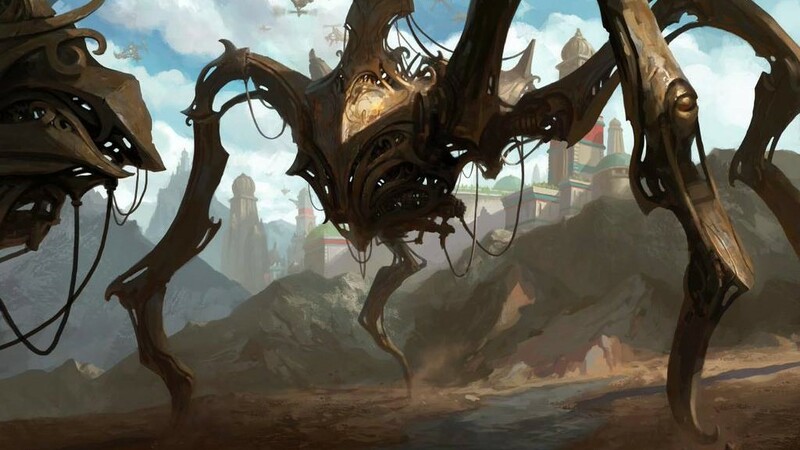 I was reading Twitter (as I am known to do) on Sunday night and Mtgprice.com writer, Travis Allen, posted this pertaining to the stock of Demonic Pacts on TCG Player. It was a card that I’d personally played with and it was powerful but it didn’t make the top 8. I quickly browsed through remaining copies and there were only a handful of sellers with the card in stock. I noticed ChannelFireball had listed theirs at a whopping $20 per copy. My acquisition price was a mere 425 Puca Points (which are like not even real dollars, right?) so I was cautiously optimistic about listing my copies for $15. It seems like a no-brainer to list the cards but I am also a player of the game. If this card breaks out and becomes really popular in Standard there is a chance of it being worth big bucks and I will need it to play. The reality of the situation is that in my testing it always felt like you had to jump through too many loops to make your deck able to play the card. It will be fringe and it might be good for a weekend but it’s unlikely to be an all-star $40 mythic for it’s lifetime in Standard. The opportunity cost to rebuy the cards later is unlikely to be more than the amount I would get for them now. I listed my copies and took a non-proverbial poop. I returned to my computer to continue chatting about the exciting Pro Tour results and I found a bite. A greater fool had rushed to purchase their copies and snatched up my playset. While you won’t always sell your cards in a single night, or poop (like in my case), but there you always have the ability to be in the right place at the right time. It takes a real Rick to known when an opportunity has come along and pounce on it. Ok Morty, enough talk about being a Rick. 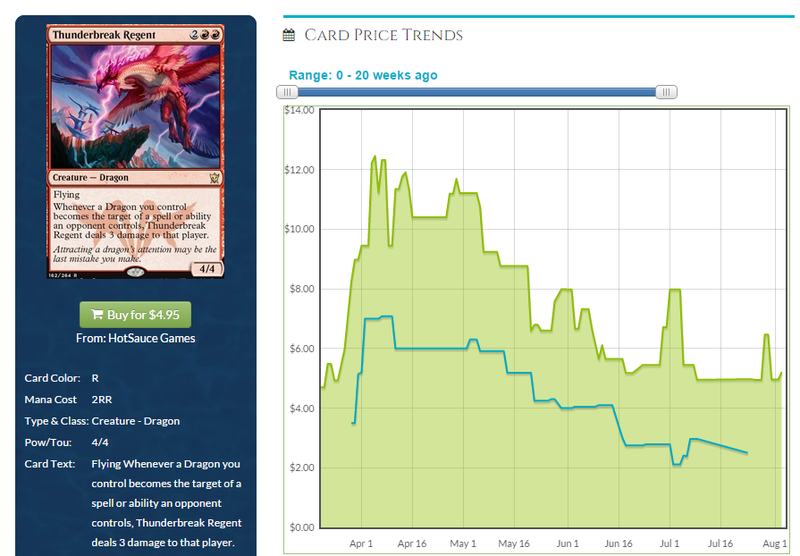 We’ve got some card prices to briefly talk about. Unfortunately, as I have mentioned before, articles are an extremely slow way to relay information. If you waited for this to come out to get advice about pickups over the weekend then we’re far past that point. Fortunately, a lot of people had been banging pots and pans and shouting from the rooftop about what cards to pickup before this weekend. If you don’t have a twitter account you’re really doing yourself a disservice and probably costing yourself a lot of money. Twitter, like most social media, is a very social platform that people talk about their interests on. While you may think it’s a place for mostly pet pictures or food pictures there are some people who would rather talk MTG finance. 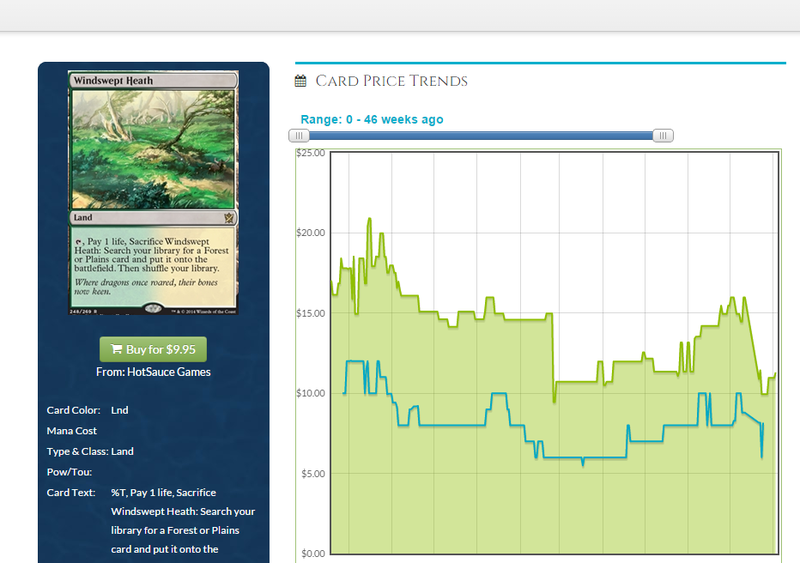 You can quickly browse the #mtgfinance hashtag but I find it extremely difficult to glean any real useful information from it. All of the writers here at MTGPrice have a twitter account that post great up to the minute information. But sometimes you have to deal with Jason Alt tweeting @Midnight hoping to become funnier somehow when they hopefully retweet him. If you had been following me, however, you may have been able to be the smartest Morty around! In between the all the “I called it”s, I posted this innocuous tweet. Now I’m not saying you should follow me for my insightful tweets, but I’m not saying you shouldn’t. Now is the part where I drop a little Rick insight into you about what I think are great pickups this week. 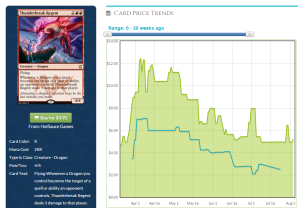 Modern Masters 2015 foils have begun to rise. Much like non-foil Modern Masters 2015 cards, a rising tide will lift all boats. I think the product for this has stopped being opened and with Modern purchases pretty much bottomed out there is no where for this card to go but up. It is unlikely people will need less of them with the constant threat of Tron and Bloom rearing their ugly heads. Windswept Heath (more specifically the clash pack if you can still find them under $25) is a fickle beast. It took a huge hit with it’s inclusion in the clash pack but this is not Bloodstained Mire. 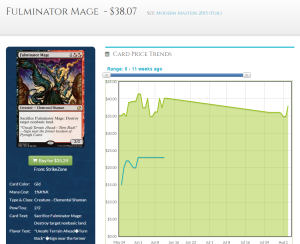 Arguably one of the best fetchlands in Modern, it’s hard to see this ever command a sub $10 price tag ever again. If you don’t own a set there isn’t really any incentive to wait any longer. My last pickups are a pair of red dragons! 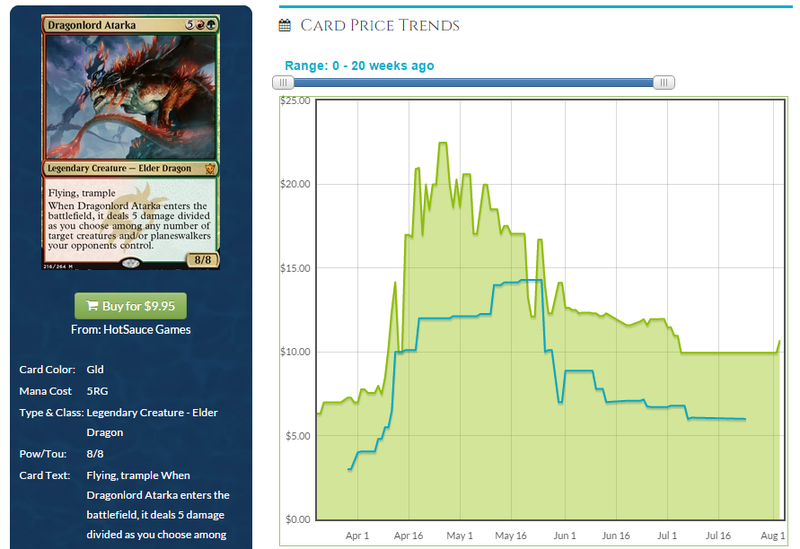 Dragonlord Atarka is the clear standout among the crowd of Elder Dragons right now. This card has the biggest upside if See the Unwritten becomes popular with some Eldrazi in Battle for Zendikar. Thunderbreak Regent is a card that will become a lot more popular in red mirrors because of it’s huge size and punishing trigger. It’s even a fringe Modern playable card. I don’t expect to see any more dips in it’s price as we get closer to rotation when there become less good four drops. Was hesitant to list my Demonic Pact Foil I picked up for $7. Sold it in 2min for $37. I wonder if I got out too early? I have a non Foil Im holding for a bit or should I sell now? Some people would pay top dollar for this kind of breakthrough.